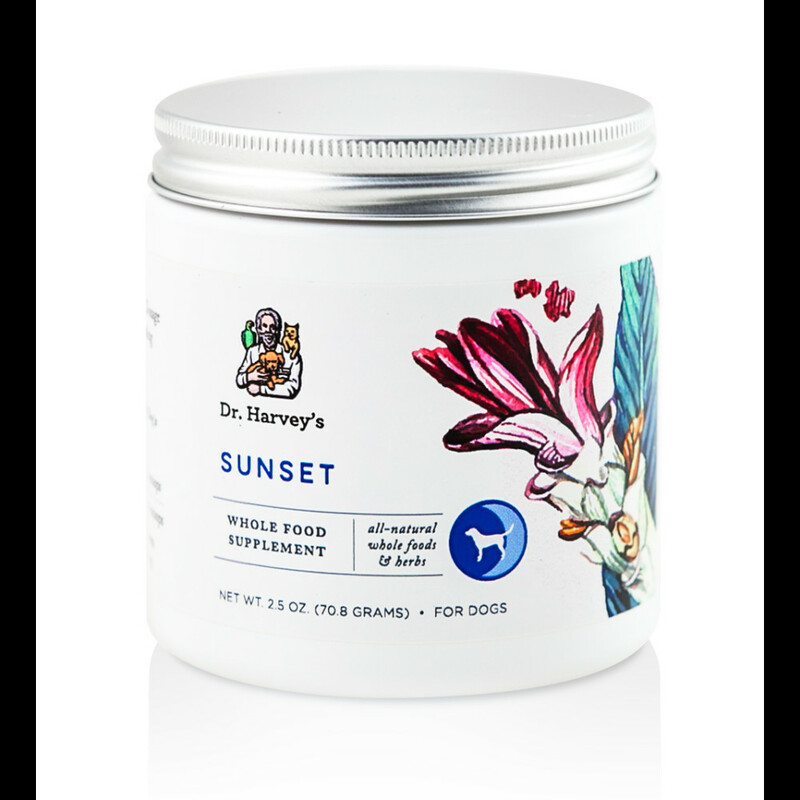 Dr. Harvey’s Solaris is an all-natural, safe, and effective whole food supplement specially formulated by Dr. Harvey to help support your dog’s immune system. Taken twice daily, this powerful mixture of medicinal mushrooms and healing herbs, works to boost your pet’s immune system and contains ingredients that may be helpful in the treatment of some cancers. 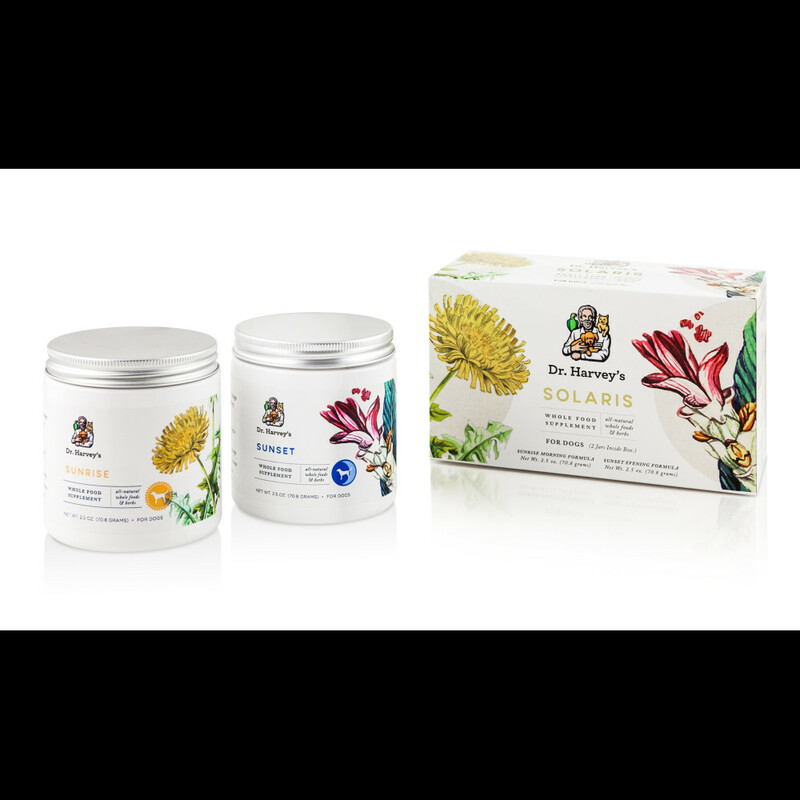 Solaris contains two jars with supplements to be taken in the morning (Sunrise) and at night (Sunset). 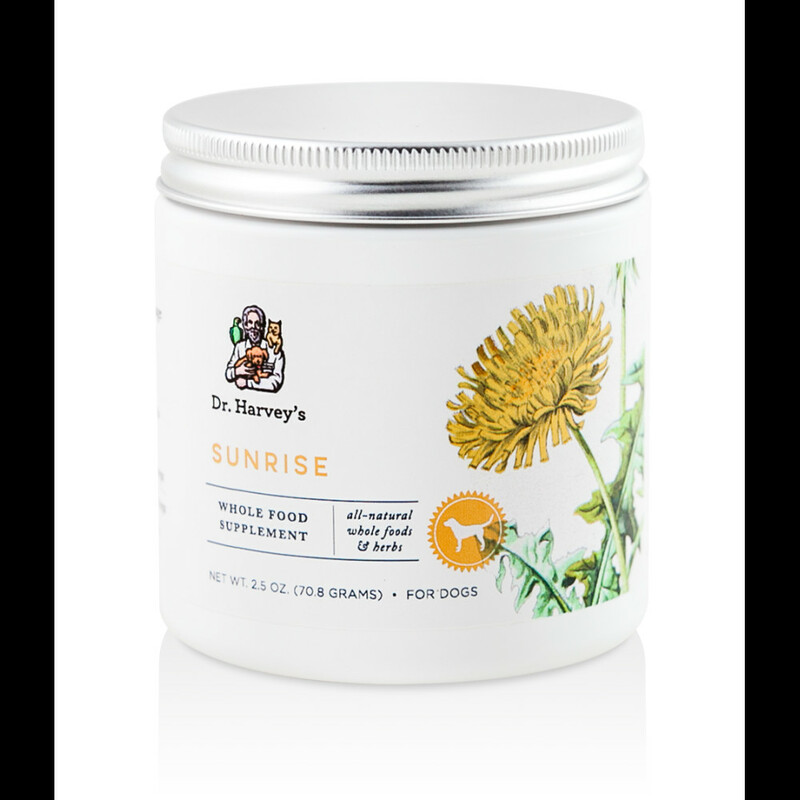 Sunrise is comprised of Organic Chaga Mushroom, Organic Sheep Sorrel, Organic Reishi Mushroom, Organic Agaricus Mushroom, and Organic Antrodia Mushroom and a variety of other herbs and plants designed to strengthen your dog’s immune system and improve a body’s ability to prevent, fight and recover from disease. Sunset contains Organic MSM (methylsulfonylmethane), a sulfur compound that acts as a powerful anti-inflammatory due to its ability to allow metabolic wastes to be removed from the cells, and Organic Olive Leaf, which may help boost your dog’s immune system and its ability to fight off illness. 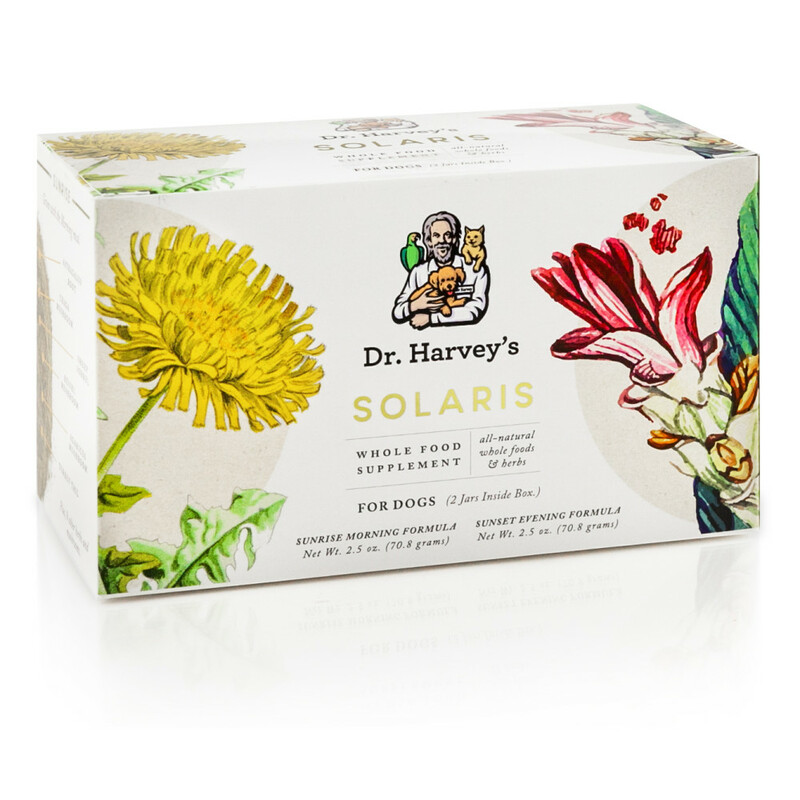 Dr. Harvey’s Solaris also contains Organic Burdock Root. Burdock Root has significant levels of vitamin C and vitamin E, both of which act as antioxidants in the body to eliminate free radicals, thus majorly boosting your dog’s immune system. These antioxidants have been linked to preventing infections, lowering one’s risk of cancer, supporting proper growth, and repairing the body’s cells and tissues. Pine Bark, another ingredient found in Solaris, provides a generous source of bioflavonoids which can help fight cancer minus the side effects of chemotherapy. 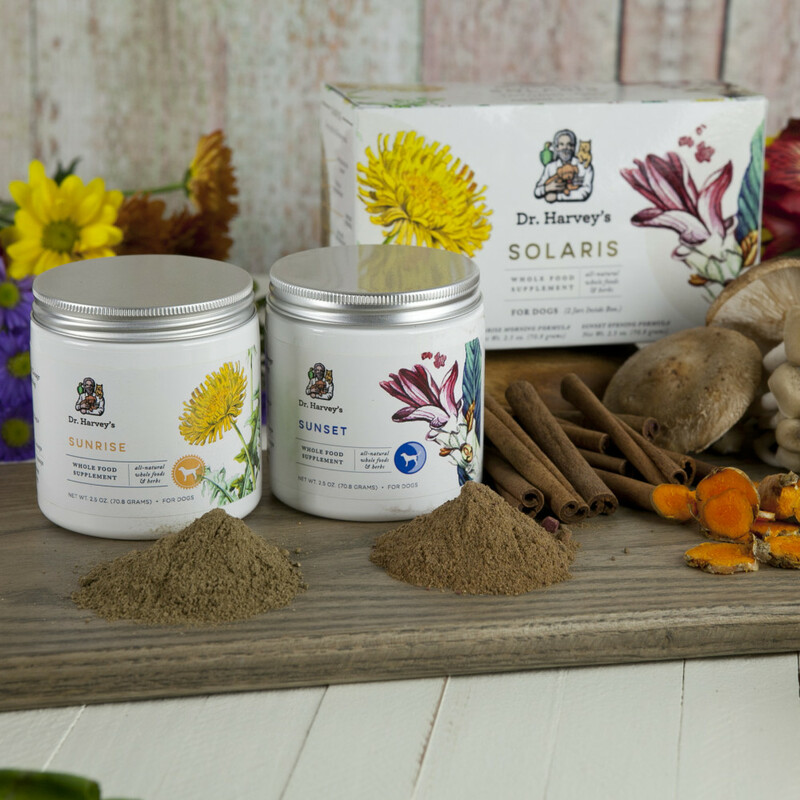 Other anti-inflammatory and immune boosting ingredients in Solaris include Organic Cordyceps, Organic Milk Thistle, Organic Burdock Root, Organic Red Clover, Organic Dandelion Root, Organic Cinnamon, Chlorella, Organic Nutritional Yeast, and Bee Propolis. 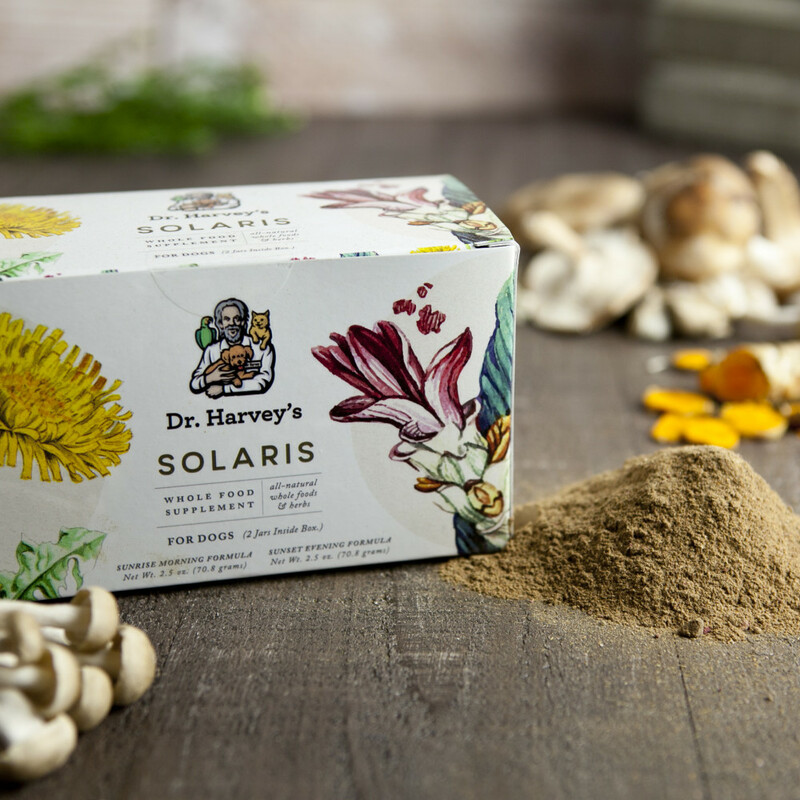 At Dr. Harvey’s, we’re dedicated to maintaining the highest standards of food safety and nutritional integrity – which is why you won’t find any preservatives, dyes, or artificial ingredients of any kind in Dr. Harvey’s Solaris. We are committed to natural, safe and 100% chemical-free ingredients and products, which is why Solaris and all of our products are made with no preservatives, no dyes, no artificial ingredients, and no chemicals. Per day scoop amount for each formula (Sunrise & Sunset). Ex. A 10 lb. Dog is given 1 scoop of Sunrise & 1 scoop of Sunset each day. If you have additional questions regarding Solaris or helping your dog that is facing a health challenge, contact Dr. Harvey today. Dr. Harvey is a wealth of information, a teacher and lecturer, he is always happy to respond to your questions or comments concerning your companion animals.